Time for yet another review! This will make 2 in one week, looks like I’m setting a new personal record. 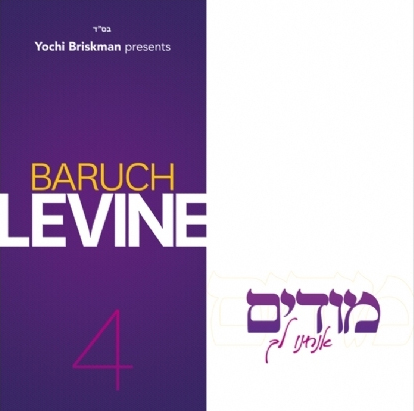 Today I’m going to be reviewing Baruch Levine’s “Modim”. In the spirit of accomplishing two reviews this week once again I think I’ll spare you all the time it would take to read my typical review-preface. Let’s dive right in! 1.Umocho – Although there are many artists who prefer to start off their albums with a bang, Baruch instead slides us (literally with that bassline) into a hartzige composition. I like how the song picks up speed after the first time around. This song was composed by R’ Baruch after the tragic passing of Dani King and Eli Schonbrun who were Bochurim in the Waterbury Yeshiva where Baruch is a Rebbi. Baruch writes in the CD booklet that he dedicates this song to their families. 2.Toda – Now that we’ve relaxed by listening to the first track we can now get moving a bit. Toda starts off pretty funky and launches into a disco style track. This track (like Yesh Tikva, Am Echad, and a few more big tracks in the works) was put together by lyricist Miriam Israeli. 3.Acheinu – Although from the first few notes of the song you may suspect a Middle Eastern track is going to start, you may surprised when the rest of the instruments come in and it turns out to be a slow waltz. This song features child soloist Yechezkel Ginsberg who does a fantastic job. 4.Uforatzto – I originally heard a snippet of this song on the preview that was released right before the album came out and I already knew that I was going to like this song. This track is done in a VERY different style than what we typically hear on a Baruch Levine album and I applaud the diversity. This is an electronically programmed song. I can definitely hear potential in this song to start being played at weddings, but I guess we’ll see as it goes. It was definitely an interesting idea to have a Chassidishe choir sing on the track but that definitely goes along with the “adding diversity” theme. This songs end in a pretty diverse way as well, instead of having a big crashing ending or fading the song out, the backing music fades while choir stays and Baruch Levine sings out the title of the song as the end. 5. Modim – Now we finally get to the title track of the album. Again, although it would seem many artists like having a fast song as the title track of the album, Baruch again decides to go with something a bit toned down. 6. Eileh – Being a big fan of solid bass, this track also starts with a nice bass slide. This is a fun jumpy song that will definitely get you moving. 7. Hashiveinu – This song starts off very hauntingly and goes into a nice ballad. Especially around Elul time this is a song with a very current message and Baruch does a great job of transmitting the message through his composition. 8. Tiferes – If you’re still holding out, you’ll now get a Middle Eastern style track on this album. I find that Baruch’s compositions like this one tend to use words which really fit within the melody. Baruch seems to pick words which don’t have to “squish” in order to fit into the song. I love the break at about 3:07 and how the choir comes back in with the beats before all the other instruments are reintroduced into the track. 9. Shifchi – For those of you who enjoy Baruch’s slow songs more than his “Fast” songs this is definitely going to be a great album for you. Shifchi is another gorgeous slow waltz. I can already hear (figuratively) this song being sung at Kumzitses. 10. Taamu – It looks like Baruch chose to end this album off with a Bang. Taamu is a nice midtempo rock track. This is also a great message for Elul Zman and again R’ Baruch does a great job of spreading it through his composition and vocals. Overall for those fans of “Hartzige” Jewish music, this is definitely an album you’re going to want to add to your collection. Packed with a bunch of gorgeous slow songs as well as some songs that will get you up and moving, this is an album you’ll want to get!